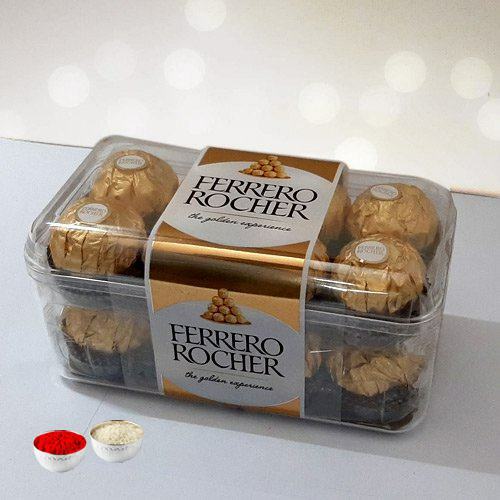 Send your special ones a mouthwatering treat by delivering our 16 Pieces of Ferrero Rocher Chocolates. These world famous chocolate gifts to India are guaranteed to delight everybody. These chocolates will leave a lasting flavor to any occasion with free Roli Tilak and Chawal. Send our Ferrero Rocher Chocolates and thrill your dear ones with its irresistible creamy chocolate surrounding a whole hazelnut held softly within a crispy wafer. These 24 Pieces Ferrero Rocher Chocolates form the ultimate delight for any chocolate lover. and free Roli Tilak, Chawal.